Truth or Dare is a board game in which players will each have to choose between a question or a dare. Perfect for parties, this game suits children, teens or even adults by offering you dares suitable for everybody! This game is completely free and does not require much, other than imagination to come up with good questions and dares ideas. However, if you want to simplify your life, you can download the truth or dare app to play directly on your mobile. 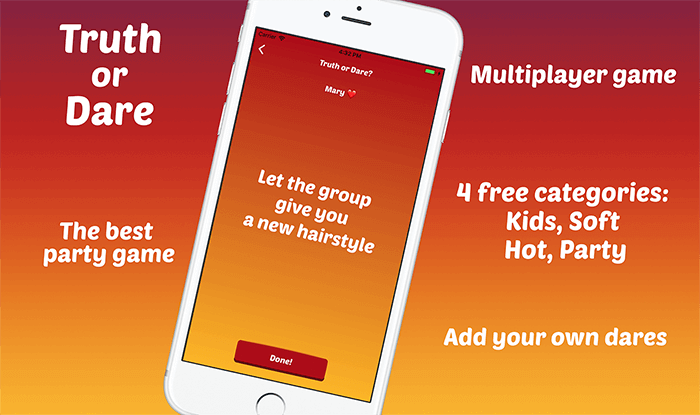 Our app contains over 1000 questions and dares for truth or dare. As much to say that you have something to do with all that! Truth or dare is probably the best questions game to learn more about your friends. You can learn new things by asking embarrassing questions but if you don't have any ideas for questions to ask then use our generator to get random questions. You can even send questions over text if you want to play with your crush remotely. You are lacking of inspiration and you do not know what truth or dare questions to ask? Use this new truth or dare generator! This tool is totally free and contains several hundreds of dares and questions. Do you want to do a quick truth or dare game with your friends? Nothing is easier, choose a category above and the game can begin! Use our questions and dares generator to play truth or dare for free right from your browser. The site enables you to play truth or dare online! If you ever want to be able to play offline, you have to download our mobile application. You will find more information about our free application below. This version enables you to play the game without downloading an application. It's easy to access and in a few seconds you can start a party with friends. Playing from the site is good, but we do not necessarily have a good internet connection... To avoid this problem, I advise you to download our mobile application. Are you looking for the perfect game for couples? Take a look at this app for couples! It’s a free game for couples available on Android and iOS. This game allows you to do dirty challenges with your boyfriend/girlfriend. And if you’re inspired you can add custom dares to spice up the game. Nowadays it’s important to try new things to avoid routine in your love life. This app for couples should help you to keep your relationship healthy.